NEW YORK CITY — Cold drinks, waterfront breezes and amazing city views aren’t a bad way to spend a hot summer day or night. Thankfully, in a city with miles of coastline, there are lots of bars where you can grab some chilled libations and drink in the impressive vistas. Spots like the Frying Pan, a huge retired ship transformed into a bar and restaurant, docked at Pier 26 in Chelsea, and the Boat Basin at 79th, right on the water, in Riverside Park, may be the crowded staples of the waterfront drinking scene, but there are some watering holes you just may not have made it to yet. We've rounded up a selection of relaxed bars and restaurants with incredible waterfront scenery — places that might just become your new go-to for outdoor drinks this summer. This spot offers amazing views of the Midtown skyline on an unassuming concrete wharf along the East River. Twelve long picnic tables sit right next to the water, where you can sip a selection of beers, cocktails and wine, and eat some of the simple fare barbecued on an outdoor grill. Along with hamburgers and hotdogs, bratwursts, chorizo and cevapi, traditional Balkan spiced meat kebabs are on the grill menu. There’s no waiter service, and no attitude at this LIC gem. With the South Street Seaport’s Pier 17 in the midst of years of construction, a bit further south, picturesque Pier 15 has taken up the slack as a summertime hotspot for views of the New York Harbor. Glass-enclosed Watermark Bar, which opened last summer, serves up a selection of beer, wine and specialty cocktails. Drinks like the Watermelon Mojito, and Riverfront Tea, made with vodka, ice-tea, mint and simple syrup will set you back $12. The eatery, which has outdoor seating on the pier, also cooks up a menu of burgers, sandwiches, and “snacks” like fried oysters and guacamole. This cafe's more than two-dozen shaded tables sit right at the water’s edge, just a couple of blocks south of the Boat Basin in Riverside Park. Relax, enjoy the sunset, and do some people watching as streams of locals walk or run past on the picturesque waterfront pathway. The café sits underneath the West Side Highway, which makes for a surprisingly beautiful architectural backdrop. House-made white sangria comes by the glass or pitchers, as does their frozen margaritas or draft beers. Specialty cocktails, which hover around $12, include the Hudson Sunset: tequila, orange juice and a splash of cranberry. To eat, there’s lots of grilled fare, like Pat La Frieda burgers for $11, and other main plates, including mahi mahi tacos and sliced skirt steak for $20, along with smaller bites for snacking with your libations. Soak up the unobstructed views of the New York Harbor and the Statue of Liberty at Battery Park's waterside beer garden. While the indoor, glass-enclosed Battery Gardens restaurant is a more formal scene, the beer garden offers up simple, inexpensive grilled bites, and reasonably priced beer and wine. Draft beer costs $5 a glass, and pitchers $16. Wine is $6 a glass, making it great spot for after work drink. 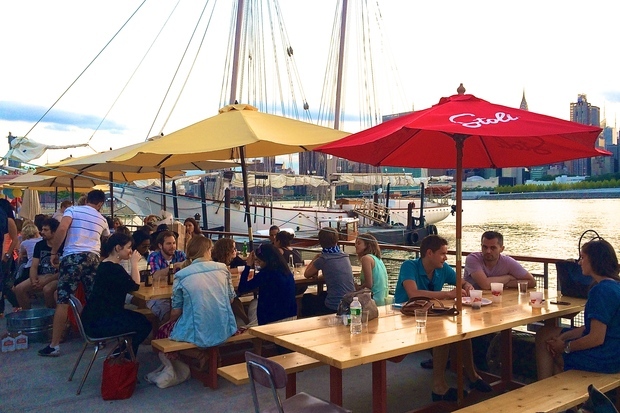 Nestled in Brooklyn Bridge Park's waterfront greenery, you'll find this small, outdoor bar at Pier 1. The spot serves up a selection of wine and rotating draft beers. There's also a variety of specialty cocktails for $13, including the French Garden Gimlet, made from St. Germain Elderflower liquor, vodka and fresh lime juice. If you're hungry, the bar offers up a selection of paninis, along with cheese and cured-meat plates. They also have a special weekend brunch menu. This cozy East River waterfront locale sits atop a rather old-school, and pricey restaurant — but the vibe at the bar is relaxed. Cook-out food like burgers and salads will run you $12, or you can slurp up some oysters at $2 a pop while drinking a bucket of beers for $36. You can also sip some summery cocktails for about $13 apiece as you enjoy some fantastic views of the East River, right off of the FDR. This 500-seat restaurant and bar, and boat slip on the Hudson River seems like a little getaway from the city. The restaurant boasts incredible views, drinks and a brunch menu. But be warned, this expansive space also turns into a bumping night-time hotspot complete with concerts and bottle service — it's some hard-partying that locals have been trying to curb. But, still even residents agree, that space and those views are killer.